I wish you a "safe" and joy-filled New Year! B&H carries the Canon EF 85mm f/1.4L IS USM Lens. Watch as photographer Andrew Eccles shoots a promo for the Broadway adaptation of FROZEN for Vanity Fair in Arapaho National Forest, Colorado. My site-related work consumes most of my time and I gave up trying to process all of my images long ago. After looking at all images and selecting down to my favorites, I just save all of the remaining RAW files and focus on processing my favorites and those that have other immediate value. 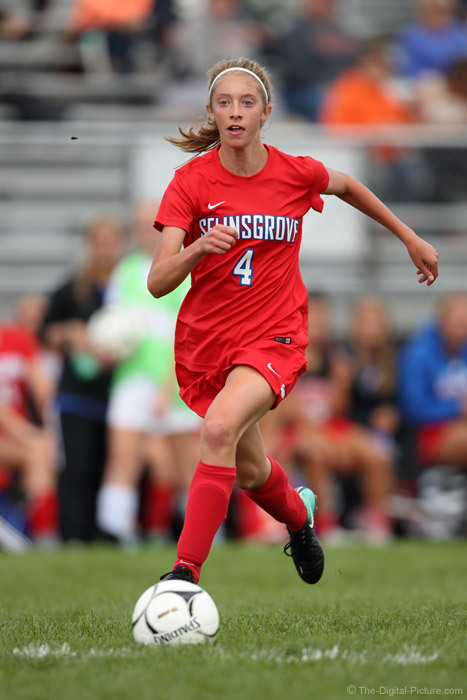 Recently, I carved out time to go through my youngest daughter's fall soccer pictures. 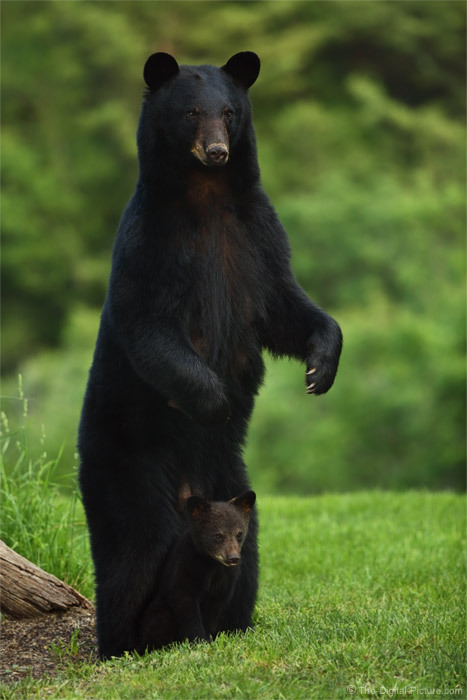 I had decided to share one with you and had the selection narrowed down to 3 images (out of thousands). Of the three images, two happened to be adjacent in a burst and one had an extra element of interest, a large bumble bee flying into the scene. 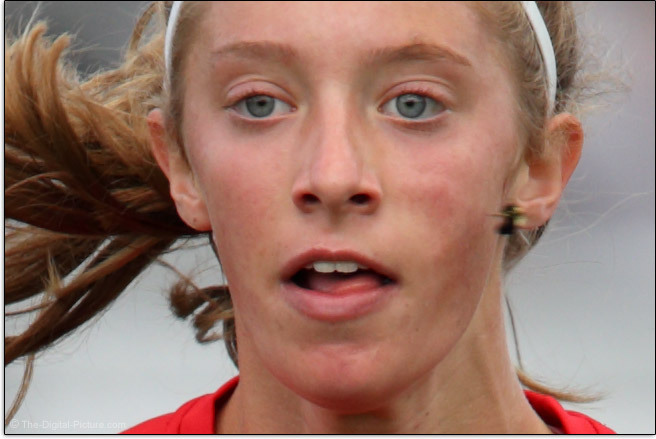 Usually, I remove inadvertent insects from my sports photos. But, as I was editing the next image in that sequence, I noticed Mikayla's left cheek appeared differently colored/shaded and ... then I noticed the bee flying backward just below her ear. The bee had flown into her cheek, leaving an indentation and then bounced off. The 1D X II's fast frame rate caught that and I was amused. Both the ball and the player's eyes are in the frame and the eyes are in sharp focus. That the entire player's body is within the frame is also often-desired. With the original image framed somewhat loosely, cropping allowed optimal composition. Desirable is that the player's body position is open toward the camera and all limbs are visible (an arm or portion thereof did not go missing behind the body for example). All limbs stretched out indicates fast action – as do both feet off of the ground. If the athlete has long hair, the position of that hair can add to an image. A positive is that the background is both strongly-blurred and very colorful. What is in the background can often be determined by your position on the sideline. While there are a lot of bad backgrounds at sporting events, the team's bench will often provide some color for you. Also, your height above the field makes a difference with the background pushing farther away when a low position is used (and the athlete appears large). The strong blur seen here is courtesy of the Canon EOS-1D X Mark II and Canon EF 600mm f/4L IS II USM Lens combination. For a sporting event, the lighting seen here is excellent. The photographer cannot choose game time and mid-afternoon, with a high-in-the-sky sun, can have terrible lighting. If the sun is bright, there will be hard shadows in the frame and especially under a clear sky, heat waves can spell disaster for image sharpness. If the sky is cloudy or the sun has set, dark conditions require a high ISO setting which means lots of noise. On this afternoon, the conditions were perfect. There were just enough clouds to diffuse the light, but not enough to require a high ISO setting. The non-directional lighting meant that I could set up optimally for both the background and for the expected direction of the game play. With this share, I wrap up my fall 2017 soccer season. And, Mikayla is safe from the bees for a few months. James Schmelzer take you step by step through the theory and techniques behind great studio lighting. Watch as James explains the build up from one light and reflector to a multiple light set up explaining the 7 different lighting patterns and what type of face they're best used for. This class will start as basic lighting and move on to advanced lighting techniques using the latest in LED technology. With the Canon EOS 5D Mark IV having been on the market for more than a year now, it's unsurprising that Canon Japan has now officially listed the venerable EOS 5D Mark III as discontinued. 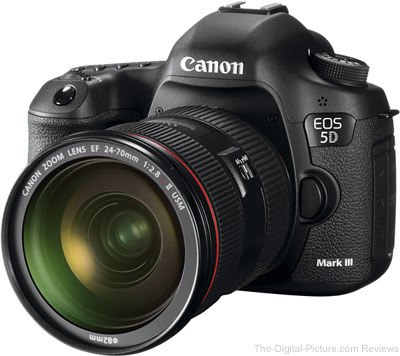 The EOS 5D Mark III was the follow-up to the ground-breaking 5D Mark II. Released in 2012, the 5D III included the video features that made the 5D II so popular but added a 61 point autofocus system (very similar to the one found in the EOS-1D X) along with an upgraded metering sensor, a wider ISO range, dual memory card slots and 100% viewfinder coverage (just to name a few improvements). B&H has its remaining Canon EOS 5D Mark III inventory nicely reduced. If you've been considering the upgrade to a full frame camera but your budget doesn't stretch to the 5D Mark IV, the 5D Mark III is still worthy of consideration. For what it's worth, the Canon EOS SL1 / 100D was also discontinued. Should I get the Canon EOS 5D Mark IV or the 5D Mark III? Should I Get the Canon EOS 6D Mark II or the 5D Mark III? To read more about these patent applications and view the relevant illustrations, click on this link and enter the patent number (without the "#" sign) in the "Publication of patent application" field. December 26, 2017, Commack, New York – Tamron USA announced the development of a new VIP Club for registered owners of multiple Tamron lenses. To be launched in 2018, the VIP Club will include select users who have registered their Tamron lenses through the company's online warranty registration system since May 2011 through January 15, 2018 (certain exclusions apply, see website for rules and details). 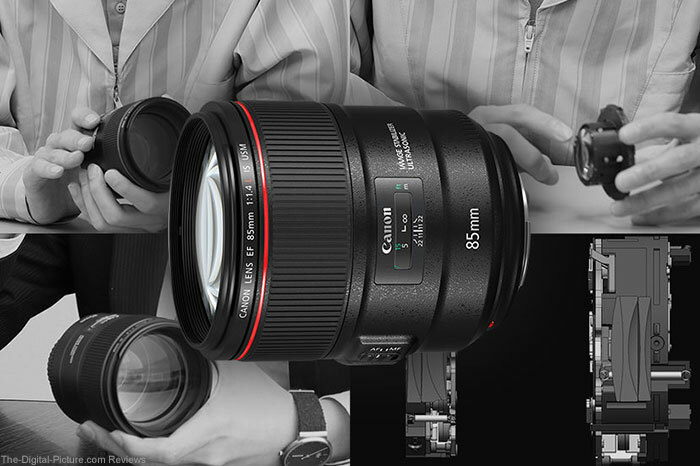 There are three VIP Club levels: Silver for those having registered four purchased lenses; Gold for those having registered five purchased lenses; and Platinum for those having registered six or more purchased lenses. Club membership will be evaluated each year to include new members who qualify and to increase the level of existing members if applicable. The VIP Club will be in effect February 15, 2018 and 2018 members will be notified by email. Complete rules and details of the program are available at www.tamron-usa.com/vipclub. Tamron owners who have purchased and registered four lenses during the time-frame of May 2011 and January 15, 2018 are eligible for these 2018 membership perks: Welcome gift; $50 bonus rebate each year of Silver status towards any Tamron lens; 50% off one Tamron event ticket each year of Silver status; 10% discount on non-warranty repairs; invitation to participate in the Tamron VIP Member contest; and three issues of the new Tamron magazine mailed to the member's home. Tamron owners who have purchased and registered five lenses during the time-frame are eligible for these 2018 membership perks: Welcome gift; T-shirt; $75 bonus rebate each year of Gold status towards any Tamron lens; 50% off two Tamron event tickets each year of Gold status; free pass to one event per year of Gold status; 15% discount on non-warranty repairs; invitation to participate in Tamron's VIP Member contest; and three issues of the new Tamron magazine mailed to the member's home. Tamron owners who have purchased and registered six or more lenses during the time-frame are eligible for these 2018 membership perks: Welcome gift; T-shirt; Tamron apparel; $100 bonus rebate each year of Platinum status towards any Tamron lens; 50% off three Tamron event tickets each year of Platinum status; two free passes to any Tamron event per year if available (excludes Summit); 20% discount on non-warranty repairs; lifetime limited warranty on any new Tamron lens purchased and registered within two years of Club induction at Platinum level; free shipping on any lens sent in for repair; exclusive Tamron Photo Tips Hotline; free 2-week lens loaners, if available; invitation to a 4-day workshop (The Workshop Summit, details below) if qualified; invitation to participate in the Tamron VIP Member contest; invitation for chance to be profiled on the Tamron website; and three issues of the new Tamron magazine mailed to the member's home. Tamron lens owners are encouraged to register their new purchase at www.tamron-usa.com (click link to go to registration page). Registration is quick and easy and owners enjoy these benefits: Instant serial number verification to ensure that a Tamron USA imported lens with 6-Year Limited USA Warranty and eligible for any qualifying rebate has been purchased; access to product information in the event of loss or theft; custom support if service is ever required; priority contact in the rare event we discover an issue with the registered product; and if subscribe is selected, invitations to local workshops, seminars and sales events, subscription to the Tamron e-newsletter and exclusive promotional offers. And now, registration has the benefit of becoming a Tamron VIP Club Member when membership level requirements are met. By now you've likely heard the same advice many times – "Shoot in RAW format, not JPEG." And the reason you hear that advice so often is because it is vital for obtaining the highest quality from your captured images. But it is important to keep in mind, JPEGs are limited to 8-bits, meaning that a lot of information originally recorded by the sensor is discarded to allow for a minimal file size. Shooting in RAW allows you retain all of the information that was captured at the time the image was taken. But setting your camera to record in RAW format is only the first step. In order to achieve the highest image quality in your final image, you need to maintain a 16-bit workflow through your entire image editing process, especially if you use multiple image editing programs in your workflow. Even if your intended output is a JPEG (8-bit), you'll get a better image quality by maintaining a 16-bit workflow until the very end. 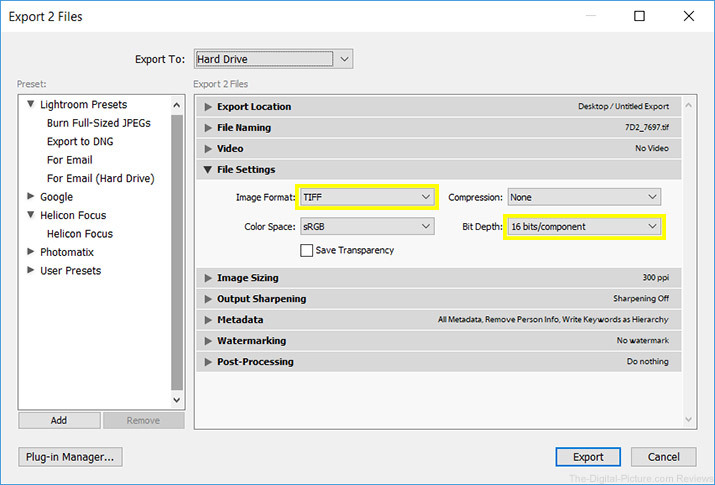 Here are some things to look for to ensure you maintain a 16-bit workflow when importing and exporting images, assuming you are starting with a RAW file. If importing a RAW file into Digital Photo Professional (v.3 or v.4), then you're working with all the information your file has to offer from the get-go. 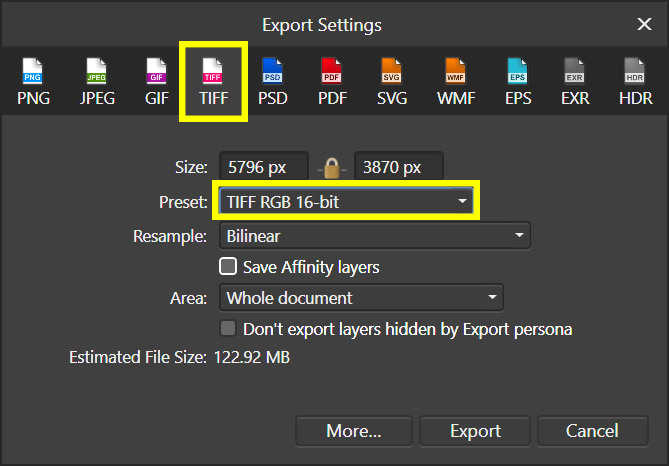 If you'd like to export your files for use in other editing programs, choose "TIFF 16bit (*.TIF)" as your export file type. Note: If you use the "Transfer to Photoshop" option in DPP, it will export a 16-bit version of the file. When you open a RAW file in Photoshop, it will initially open in Adobe Camera RAW before being imported with the chosen settings. 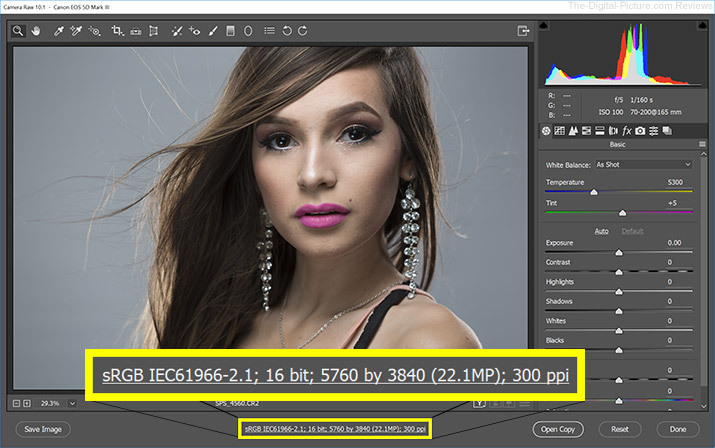 The important thing to look for here is the text displayed beneath your photo which displays the color space, bit depth, resolution and ppi settings for your imported RAW photo. If ACR says "8 bit" below your image, click on the text and choose "16 Bits/Channel" in the drop-down menu beside "Depth" in the window that follows. For saving files in Photoshop for use in other image editors, be sure to use the TIFF file format (the TIFF option is not available in the "Save for Web" dialogue) to preserve the highest quality image moving forward. If saving for posterity, saving as a PSD is recommended to preserve your adjustment layers and masks. Lightroom CC Classic imports RAW & TIFF files at their maximum bit rate, but you'll need to choose one of the non-JPEG file formats for export (TIFF, PSD, DNG or Original) to maintain a 16-bit workflow. 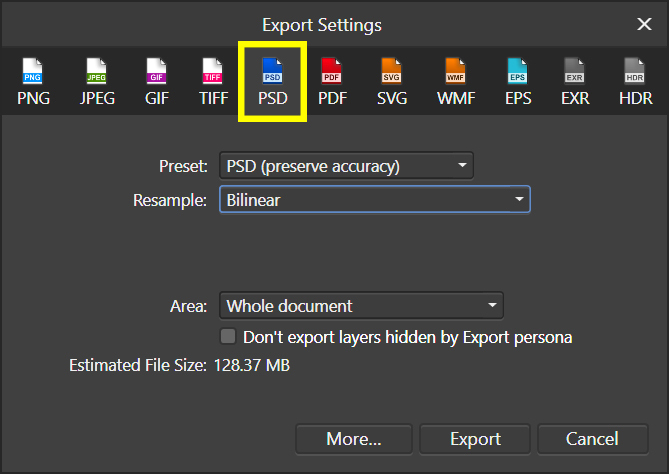 Note that "Original" and "PSD" will only be optimal export formats if you plan on further processing the file in Photoshop. If saving as a DNG, there are no other options necessary to adjust for maintaining the highest image quality. 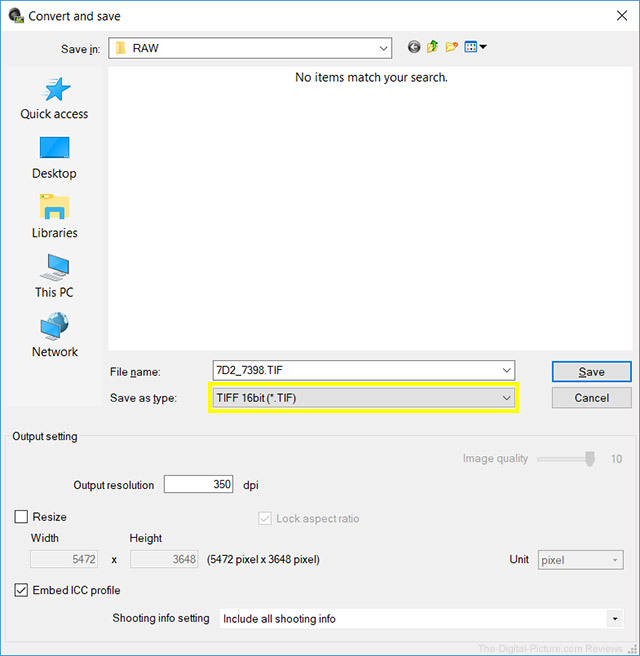 Capture One imports files at their native bit depth, so there's nothing to specify when opening RAW files. 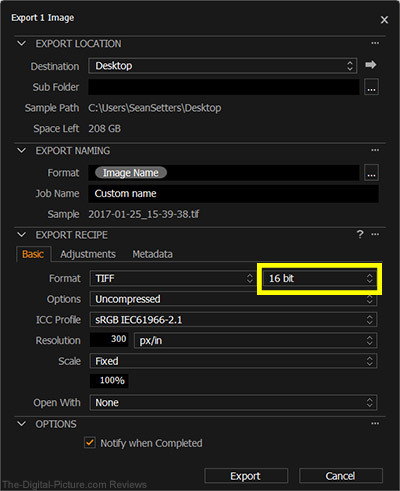 While exporting your TIFF file, you may need to select "16 bit" via the drop-down menu in the Export Recipe Format. Like Capture One, Affinity Photo will open compatible RAW files at their full bit depth. 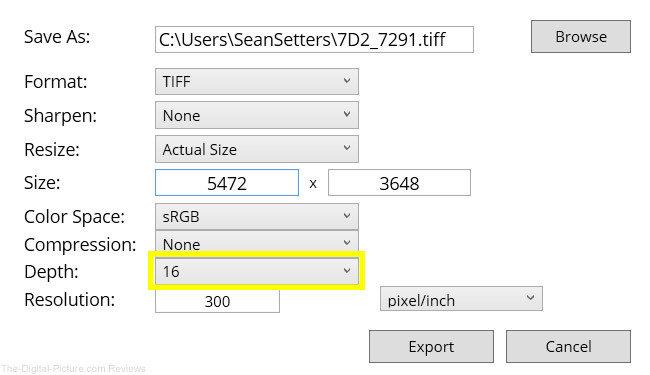 However, you'll need to specify a 16-bit file type while exporting images. The two most common options that support 16bit are TIFF and Photoshop PSD. Both Luminar 2018 and Aurora HDR 2018 open compatible 14/16-bit files (including .RAW and .TIFF) at their native bit depths, and recent releases of the software titles now allow for exporting 16-bit TIFF files, with the export dialogues being the same for both. As previously noted, shooting in RAW is absolutely necessary for obtaining the highest image quality. 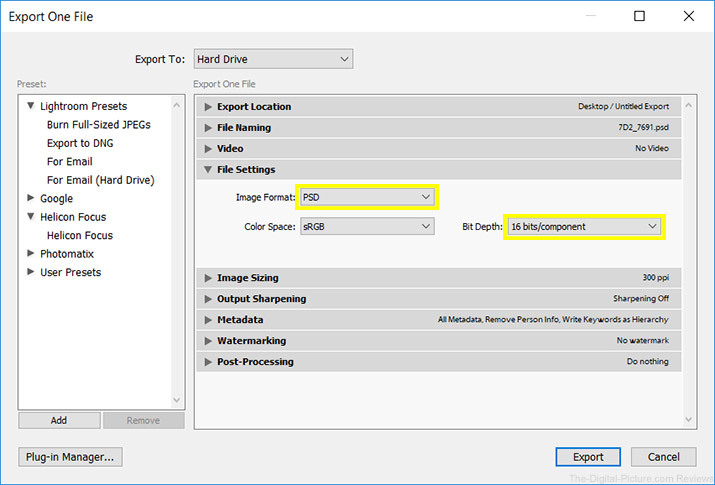 However, especially if multiple programs are being used in your post processing workflow, saving/exporting 16-bit files will ensure that your images retain high image quality all the way through publication. 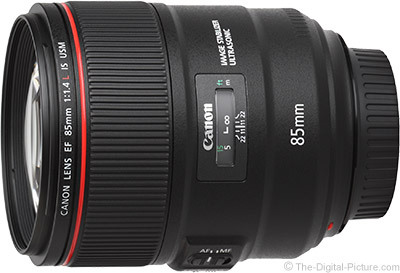 B&H has the Canon EF 85mm f/1.4L IS USM Lens in stock with free expedited shipping. In this video, renowned photographer Pete Souza sits down to reflect on his time at the White House photographing President Obama. Using intuition and professional judgment, Souza captured 1.9 million frames across the eight years of Obama's tenure, giving him a unique, personal perspective on the President. Amazon carries Pete Souza's Obama: An Intimate Portrait. From My Family to Yours, Merry Christmas!!! My family and I wish you a very merry Christmas! 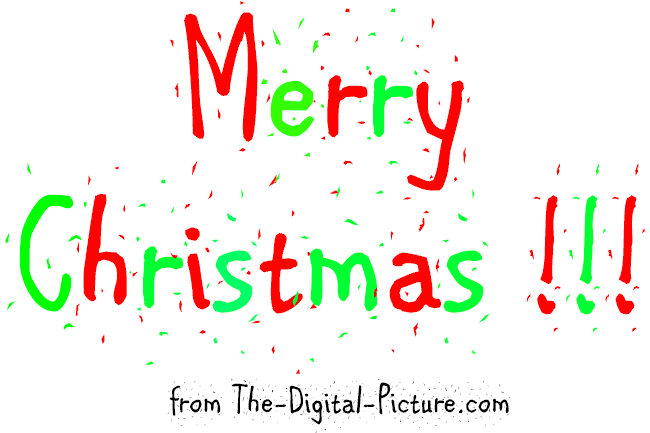 As always, we hope that your Christmas is filled with great meaning, great memories and, of course, great images. Permalink: From My Family to Yours, Merry Christmas!!! 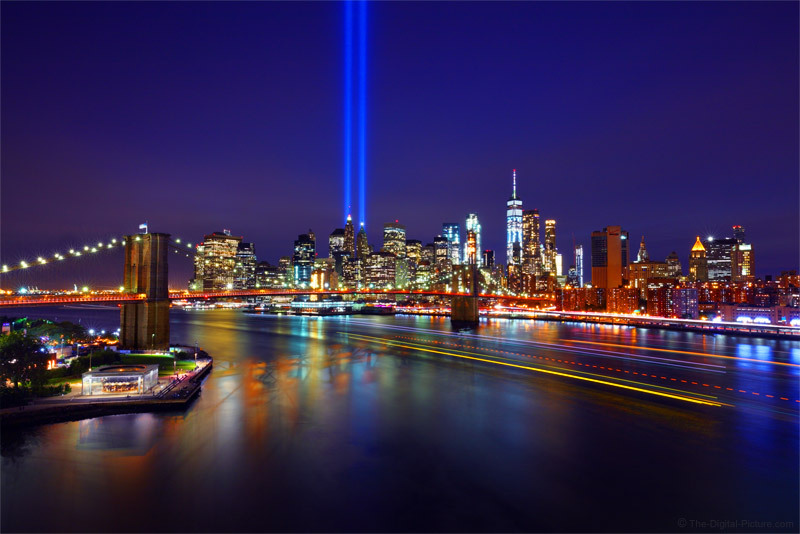 I spent some time researching the optimal destination for my daytrip to New York City with photographing the 9/11 Tribute in Light as the primary goal. While the lights can be seen from anywhere with a view over the city, I was looking for something especially nice. I decided that the perspective from the Manhattan Bridge, as shared here, was the ultimate one for a variety of reasons. The first is that I would have an elevated view on the city. This means the river would fill a larger portion of the frame (all things equal, water surface area fills more of the frame as the camera gets higher). Because the tribute lights need to go straight up through the frame, the camera needed to be level for both pitch and yaw. While a tilt-shift lens could have solved this issue, shooting from a higher elevation permits a higher framing of the scene. What can be seen from this location was another reason for selecting it. Starting on the left side, Jane's Carousel is always an attractive element to have in a NYC frame. It is also hard to go wrong with the Brooklyn Bridge, One World Trade Center and the rest of the South Manhattan skyline, any of which individually make great subjects. Even the Statue of Liberty can be seen through the bridge cables on the left side. I didn't plan on the American flag being prominently featured on top of the bridge, but it is very fitting to have it in this scene. The Manhattan bridge span is a very long one and that meant the position on the bridge needed to be selected. Because bridges move when traffic crosses them, I like to photograph over the piers where the amount of movement is minimalized. Using online maps, I verified that there was a walking area for crossing the bridge and I could see the location of the piers. I also determined that one of the bridge piers provided alignment of the tribute lights so that each was behind the pointed top of a skyscraper. That same pier appeared to also provide the best perspective of the city overall. The plan was to arrive at Brooklyn Bridge Park (seen in the left side of this image) early enough in the afternoon to scout the primary shooting location and to find secondary locations for later use. I walked the park down to the end of Pier 1, back up to beyond the Manhattan Bridge and then proceeded up onto the bridge. The online maps clearly showed a walkway across the bridge and that was indeed present. But what I couldn't see was the high fence that bordered the entire walkway, from one end to the other. I was disappointed, but it was early and I went forward with my scouting plan on the bridge. As I moved farther out onto the bridge span, I realized another significant problem, one that I thought was a show-stopper. This bridge had a very significant amount of vibration and when I arrived to the pre-selected pier, I discovered that this location was not insulated from that significant movement. However, I also discovered that someone had cut small holes in the fence at two places at this pier. While the holes gave me the view I needed, I didn't think there was a chance of getting a sharp long exposure image after dark. I decided to walk the rest of the bridge span into the city. I found one more hole in the fence over the pier on the Manhattan-side of the East River, but the vibrations were no better at this location and the view from the first pier was as I wanted. I decided to head for solid ground, but upon arriving at the preferred bridge pier, I decided to attempt a long exposure image through the hole. I set up a camera and lens and installed a 10-stop neutral density filter with a circular polarizer filter to simulate darkness. I was shocked to find that 30 second images were rather sharp. I was timing the image captures between the (very loud) subway trains passing and the long duration of the exposures were allowing the vibrations to equalize out of the final result. As I was mentally finalizing my plans to come back for sunset and blue hour photos, another photographer arrived and began setting up at the other hole in the fence. It was only about 4:00 in the afternoon and sunset was not until 7:11 PM. But ... if other photographers were arriving already, I decided I need to stay the duration to retain my optimal shooting location. The other person was very friendly, additional photographers began showing up and the time passed quickly. While waiting, I determined that a very-carefully placed camera and medium-sized lens without a hood could *just* fit between the about-4" diamond-shaped metal crossbars at the bottom of the fence and I was able to deploy a second camera and tripod I had along. The 90-second image shared here was captured just after 8:00 PM with the shutter being opened just after the ferry entered the frame, creating a long streak of colorful lights. This is a single-frame capture with the Brooklyn Bridge Park area being brightened slightly. The blue channel was boosted for a cool look and saturation was increased to bring out the colors. Check out the 9/11 Tribute in Lights Reflection with One World Trade Center for more of this day's adventure. 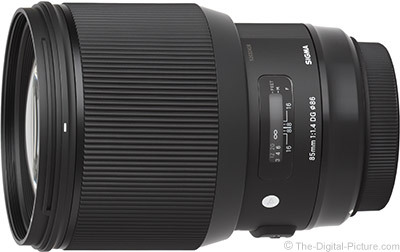 B&H is featuring two Sigma Art-series lenses as Deal Zone Deals of the Day. Both lenses come with free shipping.